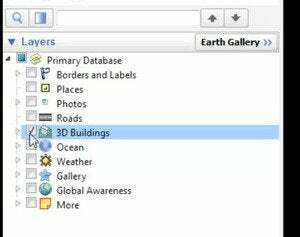 Turn on the 3D building information in Google Earth by clicking on that option in the layers panel. In a recent update, Google provided 3D building information for many cities. The option can be turned on in the layers panel in the bottom left corner. Sometimes the 3D information will take longer to load and render depending on connectivity. One of the useful features of the application allows photographers to see the position and strength of the sun. Click on the sun icon in the top toolbar and use the slider to change the date and time. Users can see the sun move across the sky and cast shadows on the landscape. Clicking on the wrench icon in the slider panel allows users to set the date and time, which is sometimes more efficient than using the slider. The tool doesn’t account for weather, but can be useful to plan photo shoots or other activities dependent on daylight. Watch sun and shadows move across the planet by clicking the sun icon and adjusting a slider. By clicking on the clock icon users can view archived map data from decades ago. Some areas will have more archived images than others and most images in the 1990s are in black and white and are low quality. Clicking a rule and selecting end points helps you calculate distances in Google Earth. Measuring distances can be done by clicking on the ruler in the top toolbar and clicking point to point. Units of measure can be changed in the box that appears when the ruler is selected.